Walmart illegally disciplined and fired employees after strikes and protests for better pay says the National Labor Relations Board. "The National Labor Relations Board, in a sweeping complaint filed on Wednesday, said that Walmart illegally disciplined and fired employees after strikes and protests for better pay." And, we wonder why people like Odin went and marched to support these exploited workers. Please sign & pass on. Walmart isn't just against mom's. Walmart is against humans. Their way of doing business is bad for all of us, 100% of us, including the Walton's themselves. Walmart is a real drag on American culture and quality of life. They rip off the government through their low pay and all of the entitlements that they get because of it, as the American people must provide food stamps and health insurance to feed and care for their workers, since they won't. They ruin vast amounts of land with there ugly superstores. They exploit workers around the globe to create huge volumes of cheap crap. There is nothing good about Walmart. It is the most maddening reality we face. "And in 2010, as the Walton’s wealth has risen and most other Americans’ wealth declined, it is now the case that the Walton family wealth is as large as the bottom 48.8 million families in the wealth distribution (constituting 41.5 percent of all American families) combined." It's a sickness to hoard money like that. What the hell is wrong with these people? Shameful. & Predictably NEW YORK CITY continues to hold the line!! Shop locally made, small business,american made!! Shameful & sick are exactly Waltons problem. Suffering from greed, selfishness, & fear. Exactly. Avoid these mega stores at all costs. Don't buy stuff you don't need. Stick to the basics. And support striking workers everywhere. Abby Martin on lack of worker rights in US. Catch the beginning, around 2:30, of this episode of Abby Martin's "Breaking the Set" where she talks about the pathetic rights of workers here in America. We lead the world with NO mandatory vacation! NO mandatory sick time! NO parental leave! NO paid maternity leave! Yet we work more than any other country in the industrial world! Woo hoo! The US is one of the ONLY FOUR countries in the ENTIRE world to not provide paid maternity leave! Go Abby for shedding a light on this atrocity! What kind of sick freaking society do we want to live in? Wake up people and demand a better life! Your country is rich enough! The money is there for all children to be raised properly and for workers to have a life! And, if you really want to get sick, keep watching this episode to see how Detroit is turning off water on it's most vulnerable citizens who can't afford to pay their looming water bills. And, gee, I thought water was a human right. U.S. govt favors corp (capital) interests over people (labor). We are fighting to take the people govt back so we can pass policies that benefit the people. Ending wage theft is part of that fight. The UK just passed a bill that requires companies to provide flexible work hours to ALL workers regardless of the reason, so not just to those caring for children or the elderly. LIFE is the reason! "Now, thanks to this long overdue change in the law, employees of all ages will be able to ask their boss to alter the way they work, regardless of whether they have dependents or caring responsibilities." "UK needs four-day week to combat stress, says top doctor"
"When you look at the way we lead our lives, the stress that people are under, the pressure on time and sickness absence, [work-related] mental health is clearly a major issue. We should be moving towards a four-day week because the problem we have in the world of work is you've got a proportion of the population who are working too hard and a proportion that haven't got jobs", Ashton said.....We've got a maldistribution of work." Why are we Americans so neanderthal on workers' rights? Why can't we see how our "work ethic" here in the US is killing our society? thanks for that - I never looked at the points until someone mentioned it to me. doesn't seem relevant to anything. Seems I have annoyed those in power. Most likely by pointing out that our liberal dems are also in the pocket of the rich. Not sure how that could upset radicals?? It's ridiculous, but I give you credit for forgetting about the points and posting anyway. What you do here is important. Perhaps your confusion on "how that could upset radicals" indicates your assumption is wrong. Maybe this might interest you more than your points. Hey ms beauty while I am with you on this one philosophically there are some real world problems to be addressed. We started a small solar construction company a couple of years ago. Not really possible for us to provide flexible hours. I also teach tennis for a living. I am leaving in an hour to run a camp 9 to 12 - 16 kids. If those who help me cannot work 9 to 12 then I cannot use them. I do not know the answer here. I have always had my own - very small - business and I think the ability of people to start a business is a really good thing. I have friends insSweden who do what I do and much more difficult there. The freedom for people at the grassroots to see opportunities is good for society. No? Hey flip. The UK has put this in place for companies with 26 or more employees, I believe. I agree with what you say, but hey, where a company can provide flexibility, they should. Too many bosses just like being bossy and controlling, and I feel like in the US they get away with way too much b.s. Why do you never have points when you start out a comment and I've noticed you are frozen at 5207? What is that about? I guess if a business owner can't run a business without providing decent wages/conditions/benefits then those business "opportunities" serve only the owner & do not serve society. So then that business owner must be identified as a bad business owner. The smallest businesses can be handled differently than larger ones, but those details should be handled later. Wouldn't wanna get lost in the weeds, or distracted from the larger goal by specifics we can't possibly resolve. Ever onward towards minimizing economic inequity. Ex-cellent (hadn't read these). It is natural evolution of labor I think. Less hours/less days will create additional jobs. And the decades of productivity gains (which workers absorbed) provide for this profound & needed transition. In extreme work focused countries (USA) I could easily see a week organized with a 4 day week & a 3 day week (for those who need less salary?). And please remember while I agree with the description of "neanderthal on workers' rights", some of us (you incl) have it right & continue to inform, pressure for these beneficial changes. The Germans have devised some interesting ways to share jobs to lower unemployment levels too. We need to get it together here to do things to alleviate suffering and quit adhering to the antiquated and obsolete Protestant work ethic which no longer applies or works in the 21st century. Feel free to join in when you have some real world experience schoolboy and tell your little brother fact less the same - he is sitting next to you - no?? That you respond with unfounded, irrelevant personal attacks rather than a substantive comment simply illustrates the weakness of your position. Not indicative of a good leader/business owner. Therefore you make my point. And by resorting to insults you in fact prove your own "schoolboy"/schoolyard mentality. How about some support for better wages/benefits/conditions for fellow decent hard working people? "Consider the fact that for every dollar of new wealth that has been created in the United States since the financial crisis, 93 cents has gone to the top 1%." "The result of this process is that we have a global economic system that favors the biggest corporations; it grants them access to ever-cheaper resources and labor around the world. The system bends in favor of maximizing corporate profits at the expense of everything else. That's why of the 175 largest economic entities in the world, 110 are corporations, not countries." This can and must be reversed if the world is to get back to some kind of decent place where human beings are the priority. Agreed. It's why I fight. A monster that has soaked lifeblood in many ways from toxic food, imported junk, crushed local labor and small business whilst reaping billions. The Waltons implemented the idea of auctioning off American labor to the lowest bidder - they thrived on America's decline...they even blamed us for it. Other business followed suit to be able to compete with this mammoth monopoly they even claimed they had to...and quickly they all profited and began to pay off our system of government to force us along for their ride to the top and our decline, the downfall of the American dream, the loss of quality and meaning and hope. This is not the America I grew up in, sure it was brimming under the surface, the greed was always ready to pounce and the leeches were ready to attach themselves, but we fought back, we had protection in our democratic system and from our regulatory boards in our FREE PRESS and our willingness to dream and care for others and co-operate. But when one monopoly became so large so fast all while destroying the rest of us - we lost control, we couldn't fight them off...the Waltons know this ship is going to sink the economy is going to crash (ask them about the bunker under their compound) they don't care if we all drown in the water... they don't believe in god or humanity - or souls, you can tell this in the way they're just going to live it up until they wink off and pummel as many people as they have to so they can ride the hog until they go. Are we going to let them use us any more? Are we going to let them and their paid politicians and media get away with it? They also spend some of the money they gouge from their customers, to actively suppress unionization. Or even organization of any kind. Made in America indeed. If only! Theres that in depth analysis we have come to expect from you over the years!! lol. Do research for depth "facebook meme boy". I can only wet the appetite. learn about issues on your own. Make up your own mind without the cloudiness of the partisanship your bankster paymasters push. Repubs against "onshoring" ours jobs! Retire ALL pols against bringing jobs home! 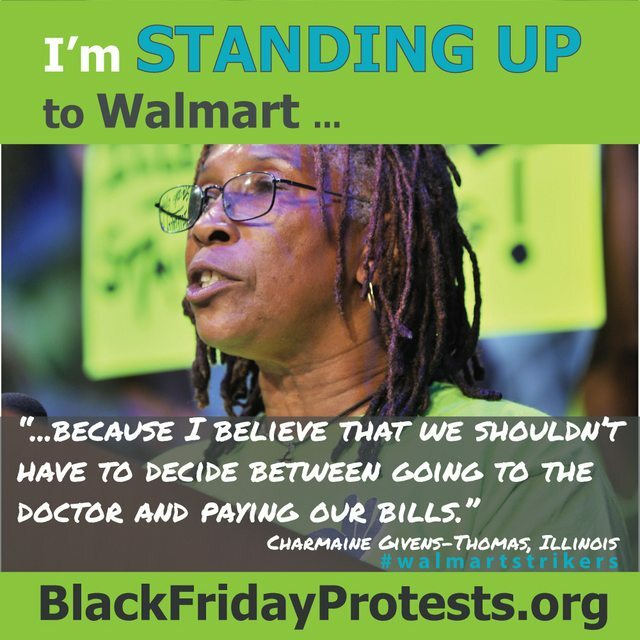 Walmart protests continue by our fellow workers around the world. Keep their/our struggle at the top of our agenda! That ain't so hard now. Is it? OTTAWA, Ontario (AP) — Canada's Supreme Court ruled Friday that Wal-Mart must compensate former workers at a Quebec store that was closed after they voted to become the first Wal-Mart store in North America to unionize. The high court ruled in 2009 that Wal-Mart was entitled to close the store in Jonquiere in 2005, seven months after workers voted to unionize. But the workers filed a new case that said Wal-Mart contravened a section of Quebec labor law, which says working conditions must not be altered in any way, shape or form during a unionization process. The court ruled in a five-to-two decision that the world's largest retailer modified working conditions for the employees without a valid reason when it shut down. The court ruled an arbiter will determine appropriate reparations, possibly with damages and interest. The store never re-opened. Sounds like a bunch of communist sympathizers to me. Move to Cuba. 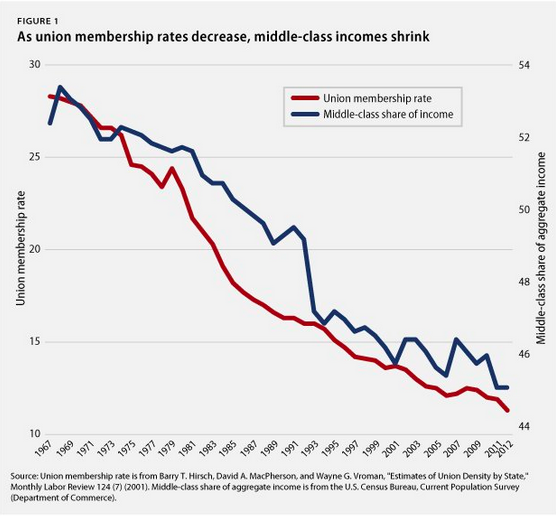 Seriously - I really liked the graph of how our incomes have dropped as union membership has declined. The rhetoric against protecting our rights as workers has been terrible. Like my opening comments. Reagan really screwed us over. Thank God for Wal Mart. The number one shopping choice of African Americans and the poor. They save them more money than any government program EVER could.